Brim: black trim with bronze studs. You're notoriously evil, Mister Blackbeard. And you've got to keep up your look to prove it. The original Blackbeard lit his beard on fire when he was raiding ships. How is that for a work uniform! Yeah, you complained about the itchy polyester polo at your first job but just imagine if your whole face was literally on fire. It was his own choice but it would still cause some serious work comp scenarios. You don't need to play with fire to add a demonic flare to your look, just pop this Blackbeard Pirate Hat on your wicked pirate head. This hat has a slick look in a faux suede and is kicked into an edgier gear with the rivets around the three tri-folds. So, get out on that boat and keep those matches far, far away. 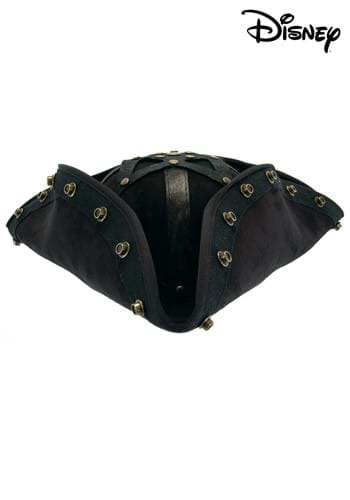 Rocking this hat is a great way to have a true Pirate of Caribbean adventure!